Visual LandPro 2000 is the ideal tool for land departments of small to mid-sized Oil, Gas, and Mining Companies that have Lease inventories ranging from a few hundred Leases to over 100,000. 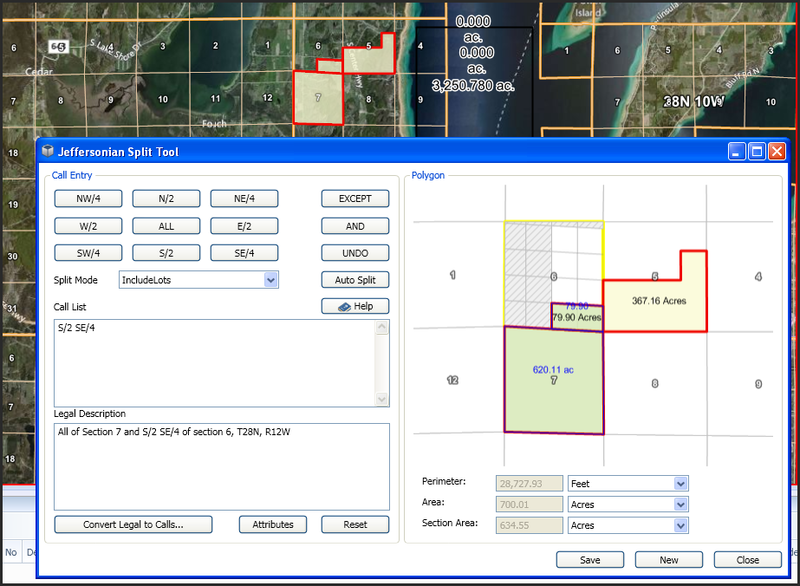 Visual LandPro 2000 provides Oil & Gas, Mining, Land Owners, and Land Service companies with the tools to record and manage land inventory details and ownership history of land parcels (including mineral and surface ownership details). Our award-winning software lets you keep track of Lease, Contract, Tract Ownership, and other land-related data. Powerful EXCEL EXPORTS allow you to create a "bridge" between our software and other accounting programs. Coal Mining companies find our optional Coal Mining Royalty Distribution Module very user friendly and efficient in paying rentals and royalties. It lets you easily keep track of your Lease Royalty Formulas, your Monthly Production Data, your Advance Royalties to be Recouped and payment history data. Email us or call us at 281-363-4213 to schedule an online presentation today! Please call us at (281) 363.4213 for more information on how to receive our FREE Visual LandPro Movies Clip CD, along with other documentation. You can also click here to send us a message and request more information. The Oil & Gas and the Coal Mining Industries have experienced a downfall these past few years. Fewer people are responsible to perform jobs that used to be assigned to more employees, especially in land departments. Critical information, including special obligations, payment obligations, important dates, special provisions, mineral ownership, acreage inventories, revenue distribution, and interest conveyances had gotten out of hand and needed to be streamlined. Land departments needed a way to facilitate maintenance and reporting of massive amounts of lease and contract data. Due to the complexity of the business, entering data, generating reports and calculating mining royalty checks was too slow and expensive when done manually or when using competitors’ land management systems. Furthermore, the user had to rely either on the software vendor or an in-house software technician to generate custom reports. WYSIWYG reports were a requirement. End-users not familiar with report generator tools needed to be able to create custom reports based on data displayed in list views, as well as custom reports based on any field in the various tables of the database. Company-wide access to scanned documents specific to every facet of the land business was also a requirement. This, coupled up with graphical display of tracts of land, would provide anyone in the company with immediate access to essential information. We developed Visual LandPro 98, a Visual FoxPro 9.0 application. It provides flexible access to land information, maps, and document images. It is a multi-user, multi-company application, following a document-oriented approach: every entity (such as leases, contracts, and addresses) is seen as a document. Visual LandPro uses a three-tiered architecture to guarantee flexibility and maintainability. It borrows ideas from the Smalltalk community and makes use of a Model-View-Controller-like architecture. It uses data objects rather than accessing views or tables directly, thus allowing us to easily switch data sources since only one set of objects is the mediator between the data behavior and interface objects. 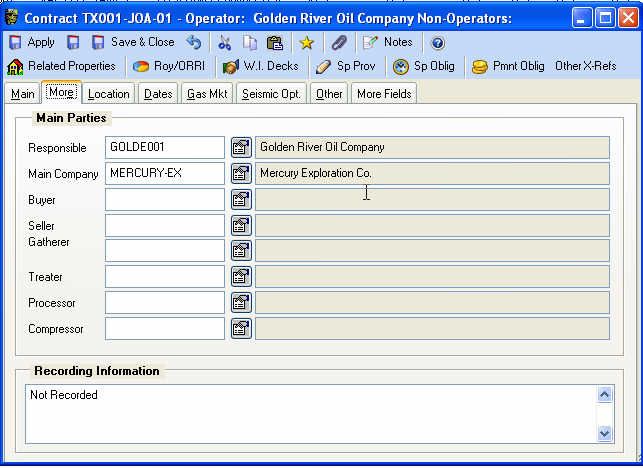 These data objects can be sent across OLE connections. The three-tiered approach is important in order to migrate Visual LandPro to the web and to support various data sources like FoxPro DBFs, SQL Server, and more. Using data objects, we are also able to support incompatible data sources (i.e. an address table from another application). The Internet is very important to Visual LandPro, therefore we make extensive use of the Internet Explorer ActiveX control. We use this control and the Dynamic HTML features to provide and add dynamic content to our “Interactive” Desktop, which, in turn, can be customized by the user. Using the Interactive Desktop, we got rid of a huge amount of useless white space and turned it into a highly effective and customizable desktop. We also use the IE4/IE5 ActiveX control to display data in a nice way, to provide online support and more. Visual LandPro also includes a stand-alone System Administrator Tool, which allows for creation of new tables and databases, displays database statistics, indexes and packs files, repairs corrupted data, reviews the error and user activity logs, etc.. In order to make Visual LandPro very easy for new users, we have made extensive use of HTML rendering coupled with the familiar Windows ’98 interface, Microsoft Agents, and various speech engines. To open or create a document, we use an approach similar to Office 2000 by displaying an open/new dialog box that shows all the different kinds of documents and templates. “Favorites”, as well as “recently opened” documents, can also be easily accessed via our interactive desktop. Visual LandPro has two different views to documents: The list view and the data entry view. The list view is a customizable grid associated with powerful filtering features: a simple, fill-in-the-blank filter mechanism and a more powerful filter wizard that allows the user to create and save any kind of filter. These filters can later be quickly accessed while working in the list view. 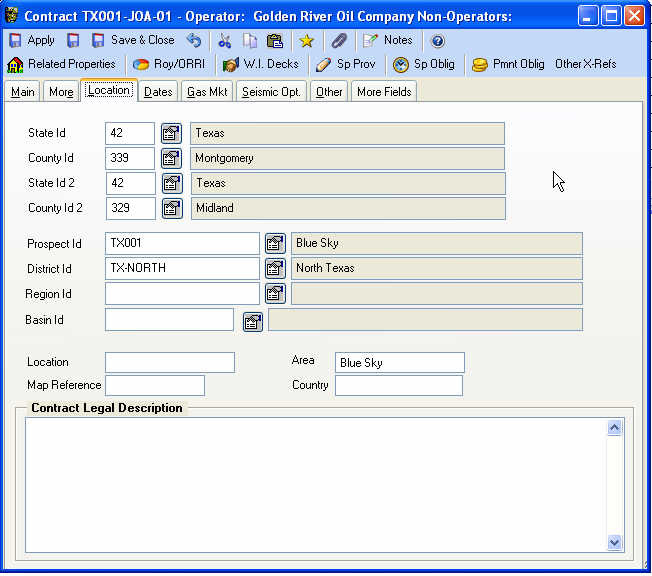 The user types something in the various filter entry fields, then clicks either the “Show Data” button or the List Tab, and Visual LandPro will display only the requested records. This filtering feature also supports relatively complex filters such as ranges, multiple values, and phonetic search. Filter “EXCLUSIONS” can also be handled in the regular filter logic. Simply add a “!” symbol in front of the value to be filtered and VLP will automatically “exclude” all records with those values. Exclusions also work in conjunction with Date Ranges. For example, say you wanted to see all lease records EXCEPT for those with an expiration date of DECEMBER 2006 you would enter the following text in the Expire Date field: !12/1/06~12/31/06. VLP also allows you to filter on EMPTY fields (or ZERO value fields). Simply enter an ASTERIX in that field: VLP will then list only records where that particular field is BLANK or ZERO. 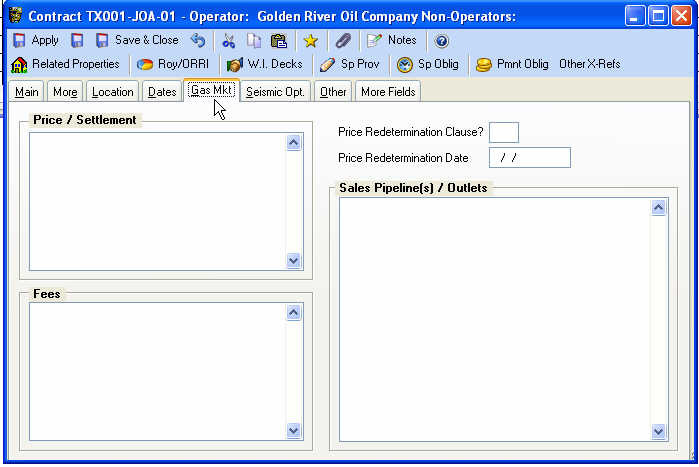 Visual LandPro’s entry forms can also display an “all-fields” and/or “user-defined fields” page, allowing the user to quickly edit data. A very important part of Visual LandPro is the print engine. Visual LandPro has a variety of report wizards that create FRX files, using Report Definition Objects and Visual GenRepoX. Another important part of Visual LandPro is the graphical representation of the various land records. We accomplished that by creating our own mapping ActiveX control (Baseline USA) using Microsoft Visual C.
Perhaps the most significant feature offered by Visual LandPro is the timesaving. For example, our ability to automatically calculate mining production royalty checks in a matter of seconds. Our data entry and calculation process is completed within a small fraction of the time that it used to take when doing it manually or via a spreadsheet program. The financial benefits to our clients were tremendous. Using Visual LandPro improved productivity and efficiency of practically every member of the company’s land department. Everyone now had immediate access to reports, maps, scanned documents – all with just a couple of mouse clicks. Anyone familiar with Microsoft Office, Windows 98, and IE5 finds himself or herself right at home when working in Visual LandPro - this translates in reduced training time thus decreasing costs. Visual LandPro produces critical real-time reports on a variety of issues, including Acreage Inventories, Payment Obligations, Rental Inquiry Letters, Division of Interest Calculations, Transfers of Interests, and, most importantly, Title History. These reports, if they were to be done manually, would take hours, days, and, in the case of Division Order calculations, perhaps even weeks to complete. Visual LandPro reduces this to practically minutes. Also, end-users want to be able to create their own “custom-reports”, without becoming familiar with 3rd party products such as FoxFire, R&R, or Crystal Reports. We developed the “Snapshot” reports: these report formats are automatically created, and are based on the current layout of the active listview window, specific to the records being displayed based on our data filters, keeping us from to having to write immeasurable number of reports for our clients! Regarding data entry, we include numerous Data Entry Wizards, greatly expediting the data-entry process. Our goal was to provide for basic lease information to be entered in 3 to 5 minutes. Visual LandPro 2000 was originally written in Visual FoxPro, storing its data in VFP9 databases. While most of our clients still use the Visual FoxPro version, we now also have VLP2000-SQL, which stores its data in SQL2012, 2008 databases or newer. Initially, reliability and performance were two of the main reasons we chose Visual FoxPro over other development environments. Visual FoxPro has a very powerful internal database engine allowing us to create a relatively cheap product version for small to mid-size customers. At the same time, we are able to create a client/server solution for our large customers, without changing the rest of the code. Visual FoxPro’s powerful object model gives us the ability to create a robust solution relatively quickly without losing the advantage of having good maintainability. The result is a low TCO (total-cost-ofownership), one of the main goals in today’s world of software development. Also, Visual FoxPro is a great tool to create middle-tier components. Together with Microsoft Transaction Server, this allows us to create scalable components without changing the existing code, breaking the old myth of “starting over from scratch with every new product version”. Incorporate different business aspects of land documents, including maps, technical data, owner data, lease descriptions, ownership issues, acreage issues, mineral rights by depth, and ownership conveyance issues. VFP allowed us to integrate all the different business aspects (applications) required to have a complete understanding of these land management issues through ActiveX controls, browser interface, and three-tiered design. Flexibility on the back end (data-tier). In order to access different databases (including VFP Data, SQL Server and Oracle), we use controller objects that talk to data. We designed this similar to the modern ADO technology, using data objects. Controller objects talk to data and hand it over to the middle tier. Since all the modified data is present in the form of objects, it can be handed over to all kinds of interfaces, thus meeting changing customer requirements. Allow end-users to create reports. We created an OO FRX-creation engine we use in all report wizards and snapshots. We needed a way to quickly receive error messages from our users. The Visual LandPro error-handler uses FoxPro Foundation Classes. It stores comprehensive information about the bug and the environment at the time of the error, then it allows the user to email it to our email address for technical support. Handling Binary documents. These are usually scanned graphic images. They may be anywhere on the network, or on CD-Roms. The major problem was different workstation drive mappings. Handling complex grids and filters in a generic fashion. List views are built on the fly. All the columns in grids are subclasses of regular column classes which was a rather large challenge since VFP doesn’t support using different column classes in the Visual Class Designer. Our grids handle standard tasks such as resorting, filtering and alike automatically. Grids (and the attached fill-in-theblank filters) are configured using our special grid-builder. We needed to provide an easy way for “filters” to be created and accessed at different times. We created a powerful filter wizard system, which automatically gathers information from the database, and grants access to almost all filter options supported by Visual FoxPro. In many cases, multiple users needed simultaneous access to the same document. We developed an “Automatic Conflict Resolution” engine, where we provide a way to automatically merge changes, in a fashion similar to Visual Sourcesafe. Visual LandPro attempts to merge the changes on its own, but if it gets confused, it asks the user to help decide how to proceed. GENDBC could not handle complex databases. We wrote a OO GenDBC-like class which creates and maintains complex databases. The class is maintained automatically by a builder we created. The business problem required a very flexible way of viewing and editing data. We achieved this goal by using HTML within our application. The user can modify those HTML screens to set up his/her own views, edit forms and business rules. Implementing the World Wide Web was very important for our users. We tie into various sources of content including our own web site as well as third party sites such as Microsoft Expedia Maps. Supporting MTS, Web version of the full product, offline views, printing reports in Word and Excel format. Visual LandPro 2000 (www.landpro.com) has a simple, yet intuitive Desktop Main Window. We modeled our software after Microsoft Office. Data is stored in popular Visual FoxPro tables, and it is easily "exportable" into other Microsoft data formats (such as MS-Excel and MS-Word). Displaying Lease Lists is extremely flexible with Visual LandPro 2000. You can even use our Field Chooser utility to specify your own Custom Lists. Then, you can activate/deactivate our HTML Preview List logic in order to view MORE data on individual lease records as you quickly scroll up & down the list page! Acreage Calculations is perhaps Visual LandPro's best attribute. Net Acres, Gross Acres, Entity Share, HBP Acres, Developed acres, Undeveloped, Mineral Acres, Surface Acreage, and much more. See why so many land owners and Oil & Gas Exploration companies have chosen Visual LandPro 2000! Call us for a FREE DEMO MOVIES CD at 281-363-4213. This image lists the extensive lease "toolbar" menu-items available in Visual LandPro 2000. The 2nd row of buttons (Tracts, Roy/ORRI, W.I. Decks, etc...) opens various grids with data specific to your lease. Same for the "Other X-Ref" Menu. 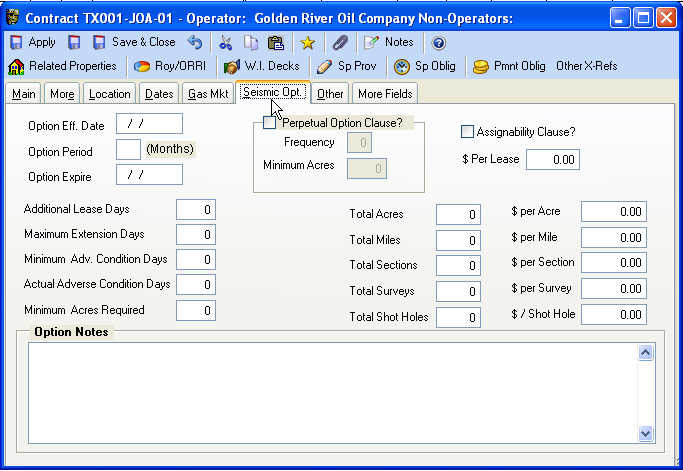 Example of LandPro's Lease View/Edit Window (Page 1 only) . (Note: this is NOT where you enter data for New Leases / this is where you can VIEW or EDIT data on existing leases). Acreage calculations are done easily and correctly in Visual LandPro, since it is a true "Tract-based" land system. 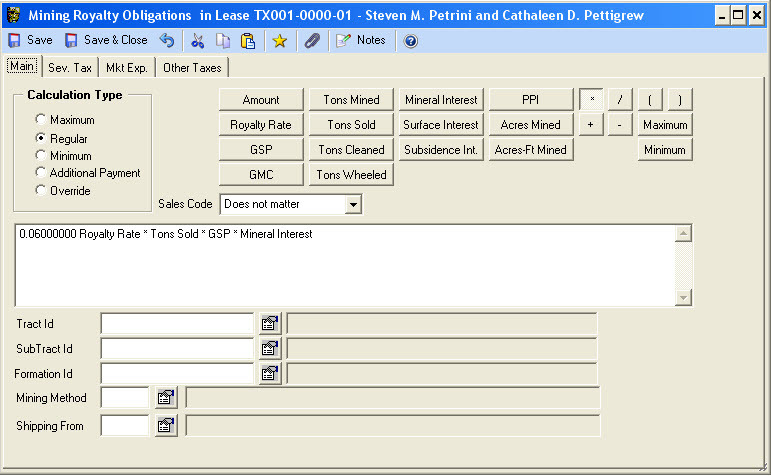 Tracts can have an unlimited number of ownership records (minerals / surface), which in turn get associated with leases. Your tract data is quickly created using our Tract-Add Wizard. Oil & Gas Exploration Companies and Coal Mining Companies can setup tracts and appropriate surface and mineral ownership interests. The owners' interest is then cross-referenced to the lease. Visual LandPro's NAME & ADDRESS entry form was modeled after Microsoft Outlook's "Contacts" entry window. We automatically "parse" your Name & Address data so that it is stored in such a way to facilitate mail merges you may wish to do in the future. More on the latest PRINT Dialog windows below under "Reports". Visual Landpro is ideal for companies that want to have a good handle on lease and contract records, yet want to continue using their accounting software of choice. Why be limited by feature-lacking “add-on” lease modules, created primarily to provide a sense of “security” when it comes to the wonderful concept of integration of land with accounting. The bottom line is that if the land “add-on” modules don’t do the things you need in your land department, then you cannot get your job done most efficiently. There is truly no comparison between most accounting software “add-on” land modules and a full-land system such as ours. Accounting software companies are primarily concerned with marketing their applications to accounting departments, as that’s who keeps them in business. Satisfying land-departments it not their top-priority job. The subject of “true integration” between lease records and accounting is an important issue. Although some integration will exist in land add-on modules to accounting systems, this is oftentimes outweighed by their lack in functionality from the land system’s prospective. In order to operate most effectively, the land department needs a good land management program. Here at LandPro Corp we have been working for over 20 years with people like you: land managers, lease analysts, division order analysts, field brokers. We take pride in our software and services. Our main focus is land management software development, and that is what we do best. Over the years, we have seen dozens of companies come and go, but even more, we’ve seen land professionals coming back to LandPro for all their land management needs, especially after they’ve tried other “interesting sounding” land add-on programs, that unfortunately simply did not meet their requirements. If you have not worked with Visual LandPro in the past but would like to do so, here’s how you can try it FREE OF CHARGE: call us and let’s setup a 1-day training class for you, “INTRODUCTION TO VISUAL LANDPRO", here at our training facility in SPRING, TX. We’ll then give you a FREE 30-DAY FULLY-WORKING LICENSE of VISUAL LANDPRO for you to take back and setup your own leases, minerals, contracts, document images, division orders, etc. Some of our competitors try to sell you on the “most” important features in land management: “integration to accounting”. However, keep in mind that integration is meaningless if what they’re integrating is a feature-challenged land module instead than a complete land & contract management system such as Visual LandPro. Please do not hesitate to contact us for a list of our clients, especially those that have had the opportunity of working with their accounting land modules also, and compared them to Visual: see for yourself why they chose to stick with Visual LandPro - you’ll be glad you did! Visual LandPro exports its data to EXCEL WORKSHEETS. Chances are that your accounting software can read from Excel. We can always modify our code so that our Excel worksheets automatically come out the way you want them. LANDPRO such as NAME & ADDRESSES, REVENUE DECKS (DOI’s), and PAYMENT HISTORY should not be a problem. Call us and we can discuss this with you in more detail. We take pride particularly in the following 2 items: our lease setup process (via our “Lease Wizard By Tract”), and our data sheets (unsurpassed by any other software competitor in the industry). Also, we offer over 250 “pre-defined”-reports. Plus, you can also copy and modify most of these yourself. And even add your own thanks to our DILMAD REPORT WRITER program. Installing Visual LandPro is EASY. We quickly walk you thru this, or even do it for you if you have an internet connection! Data backups are also very quick and easy: no need to be a computer guru to safely backup your data in VLP2005! We provide unlimited technical support to companies subscribing to our annual subscription plan. We promptly return phone calls and emails: you even get my home phone number and cellular number, in case you have a question after-hours or on weekends! Can’t beat that. Still, don’t take my word for it. TALK TO OUR CLIENTS. Ask us for our latest client list. E-mail or call these people, and ask them questions. See if they’re happy with Visual LandPro. Ask them whether Visual LandPro is getting the job done for them! Then come and take one of our INTRO TO VISUAL LANDPRO courses, and try out software FREE of charge for up to 30 days. It is a WIN-WIN situation. You will be glad you did. Quickly and easily list your LEASE RECORDS using our user-friendly FILTER windows. We even have "Advanced Filters" which can be SAVED for later usage. 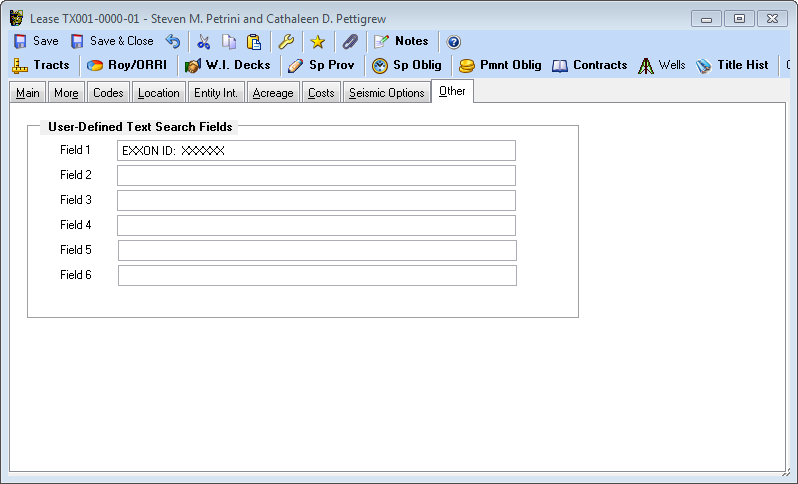 Searches can be based on any words contained within your search fields, date ranges, special provisions, and much more. Leases have multiple entry pages. The layout of the 1st page flows basically similar to most O&G Leases. Lease entry pages have been laid out in an "importance" scale, with the most important fields starting on page 1. Important dates, Related Parties, and Lease Codes. You can use our pre-defined codes, or create your own! You can then set FILTERS based on your various codes. Lease Edit - Page 5 | Entity Int. Quickly view a summary of YOUR COMPANY's Working Interest decks. You can have unlimited number of "decks". You can specify which deck is to be used in calculations for Payment Obligations, Division Order calculations, and Acreage calculations! You can also specify your W.I. Decks to specific Tracts & Subtract within each Lease. Visual LandPro allows you to QUICKLY setup your lease special provisions! Each provision can have unlimited length text associated with it. You can batch-add them and/or "import" them from other leases. But - best of all - these get "imported" automatically from your Lease Form when you first create your lease using our Lease Wizard by Tract tool. You can setup unlimited number of Payment Obligation records for each lease (either "recurring" or specific to a certain date). In the example below, we have a lease with two payment obligations: a monthly recurring Right of Way payment, and an Annual recurring rental payment. Payment Obligation records are created for you AUTOMATICALLY when you first enter your lease data using any one of our Lease Add Wizards. Pay Regardless of Suspense Code? Pay Regardless of Lease OK to Pay Status? Here you can see your Mineral and Surface Ownership in each of your lease tracts. Outstanding Mineral & Surface Ownership specific to your lease tracts. 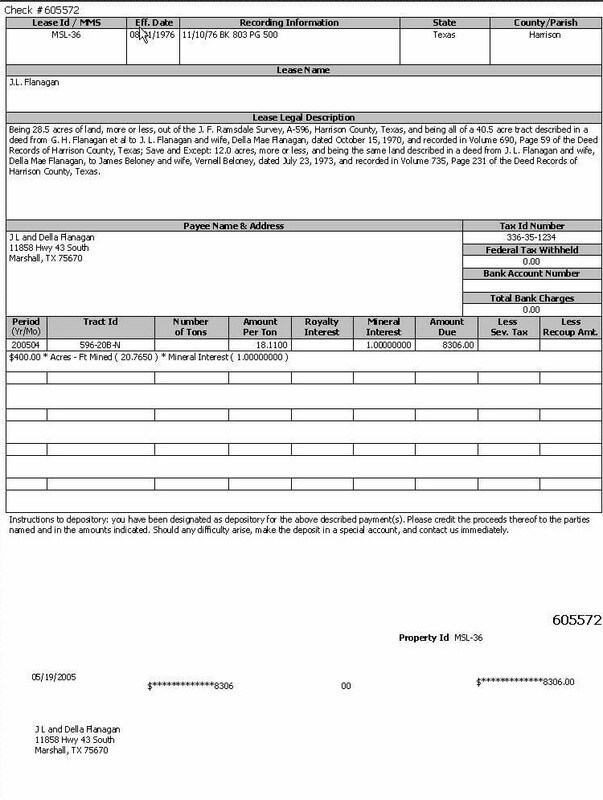 If the tract(s) that this lease covers have additional mineral and/or surface owners (which may be linked to other leases), here you will see these "oustanding" ownership records. Tracts are made up of at least ONE subtract. Subtracts basically specify the "type of acreage" (whether it is "developed" - thus associated with a well or unit), or "undeveloped"). 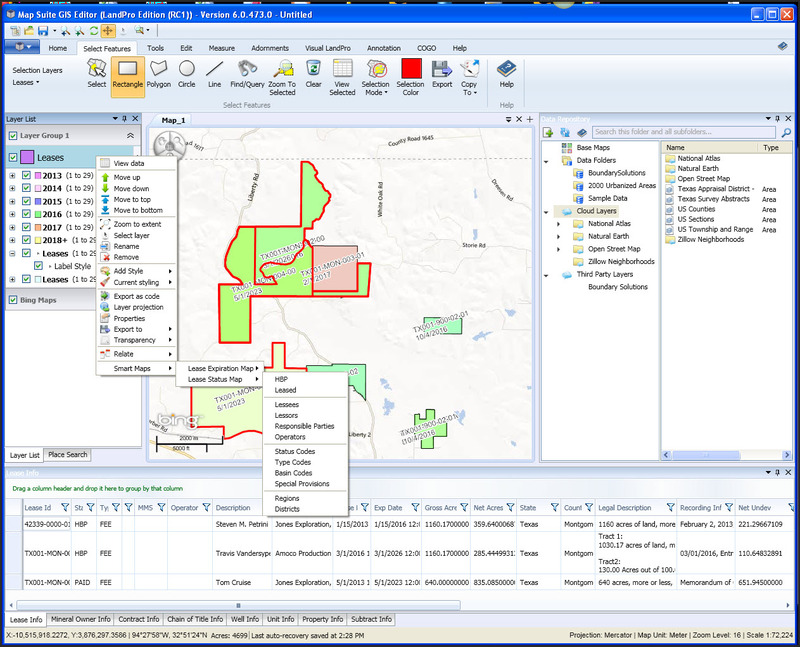 Visual LandPro automatically creates subtracts when you use the Tract Add Wizard to create new tracts. 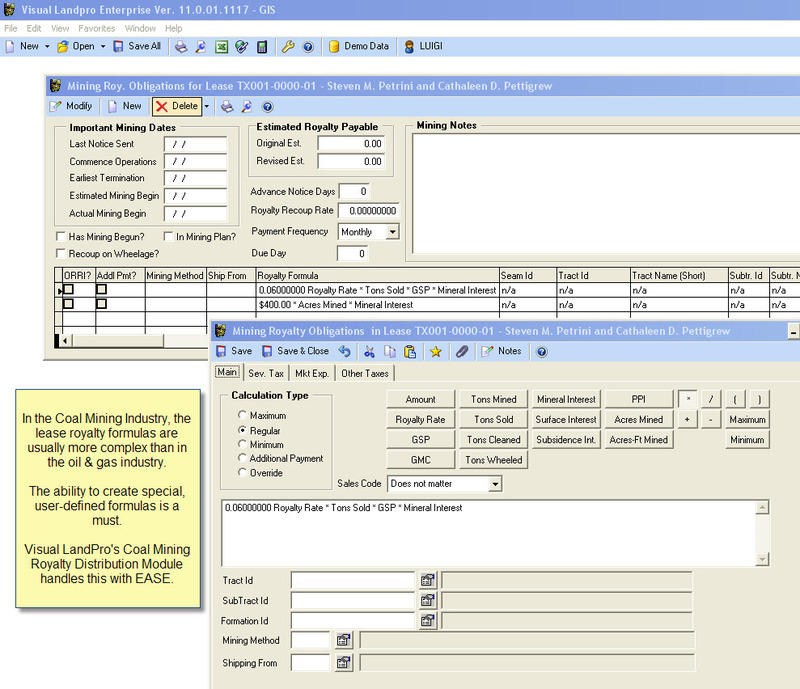 Visual LandPro also provides the ability to setup royalty-specific data for MINING COMPANIES. Each lease can have unlimited number of "royalty obligations". A special Mining Revenue Distribution Module is available for those Mining Companies needing the ability to pay royalties on production such as COAL PRODUCTION. See our PRODUCTS page and our SCHEDULE OF FEES page for more information. Contract - Page 6 | Seismic Opt. Mining Companies (coal mining and other hard-minerals) can quickly setup Monthly Production worksheets thanks to our Mining Revenue Distribution Module. LandPro will then automatically "split" your production to the various royalty owners, and calculate what payments should be done. Please CALL US for more information on our Mining Revenue Distribution Module. This add-on module is ideal for COAL COMPANIES needing a flexible royalty distribution software system. This is an example of what your Coal Mining Royalty Checks will look like. Checks can be easily modified to fit practically any 8.5 x 11 sheet. See other images regarding our Coal Mining Software module for Visual Landpro 2000! Our Document Imaging System allows you to link unlimited number of Images (JPG, BMP's, TIFF, etc..) practically with any LandPro records (leases, tracts, contracts, owners, etc...). Without "reinventing the wheel", we basically provide you with a simple mechanism with which you can cross-reference your records with external IMAGE files. Baseline example 1. Baseline is an affordable deed plotter program, which can be used as a stand-alone application or be incorporated within VLP. Baseline example 2. Example of Township-Range-Section call map. Visual LandPro can quickly generate Data Sheet reports for all your properties, including Leases, Contracts, Owners, Tracts, Wells, Prospect, and many more! You can specify the Printint Order of each "band" of data. And also whether you want to show or hide each band. Data Sheet "Status" Reports can also be generated / here you would basically see multiple leases (but a few data bands at the most) on single reports pages. When you generate data sheet reports, you have the option of printing MULTIPLE LEASES on the same page, and selecting just a few "data bands" to show up in your report. The result is our "Lease Data Sheet Status Report", a very "flexible" type of report where the end-user basically specifies what data to display, without "page ejects" between each lease record! Snapshot reports are EASY to generate! You can re-arrange the display of your data, then simply RIGHT-CLICK on your List Window, and select the Preview / Snapshot report option. Also... very similar logic to export your List records to Excel..
Link Images or Documents Anywhere! Visual LandPro has access to various tools that will facilitate your data maintenance as well as help tremendously in "exporting" your land data in formats that other software systems can understand. The Database Export / Import function allows you to quickly export and import your LandPro data to/from Excel worksheets. The Lease Mass Update Wizard provides quick updates of numerous lease fields. The Tract Deletion Wizard quickly help you remove old tracts (no longer in use). Windows: Windows 10 PRO or ENTERPRISE Ed. Processor: Pentium IV-class, 2.4 gigahertz (GHz) or faster, Dual Core minimum. Monitor: Minimum Resolution 1280 x 1024. Browser: Edge, Internet Explorer 11 or later recommended. VLP is powerful, yet user-friendly. Intuitive, yet sophisticated. With many "core" concepts originally implemented in our established LANDPRO 6.0 software, Visual LandPro has been designed from the ground up in a totally object-oriented approach, designed to satisfy most of today's Oil & Gas and Mining companies land department requirements. VLP is designed for companies serious about their land records management! It keeps track of leases, contracts, seismic options, mineral interests, well data, tracts, rental checks, 1099s, and a whole lot more. Optional modules include our Document Management System (Scanned Images, MS Word Documents, and HTML documents), DIVISION ORDERS System, and an AFE Module. True Windows. Right-click on any form or grid or desktop to access different menus. User-Customizable Interactive Desktop (Dynamic HTML-based). 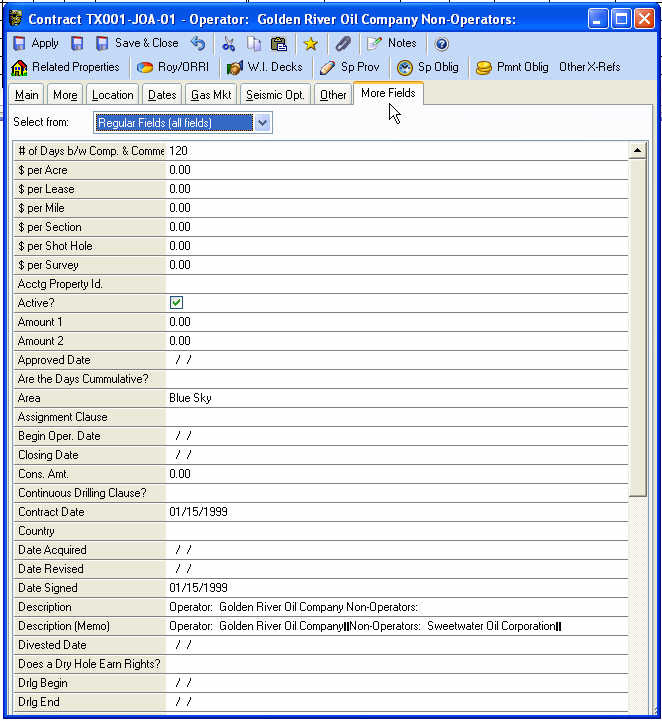 "Tab-style" forms for data entry. Unlimited number of Working Interest Decks per lease. Records can be easily copied among decks. Unlimited number of Special Provisions per lease / well / unit / contract. Prospects are assigned at Tract level. Leases can now cover more than one prospect. Lease Data Entry Wizards. - Definitively makes lease entry a snap! A few logical steps guide you in setting up the minimal amount of data for your lease. Specifying the Lease Form Code also brings in automatically all Special Provisions specific to that form! Tract Data Entry Wizards. - With just a few steps, we create tracts, subtracts, and well-cross-references. Mineral Interests can be "imported" from other tracts, if appropriate. Favorites - when you are editing a form, or just browsing a grid, you may now "save to favorites" in order to return to where you were working in at a later time, or assign a task to a co-worker. Multiple Instances of Forms. You may now open several leases and/or other records simultaneously. Forms can be maximized. - This allows you more room to enter and/or view your data. Forms can be "synchronized" with their parent grid. This allows you to view/edit several pages of a lease simultaneously. New and Improved Filters. These can be saved for later retrieval. They can also be applied to other filters. If requested, "saved" filters can be made available to others to use. More printing flexibility. Reports are accessible from most grids and entry forms. User can select individual records to be included using the tag-untag feature. NEW! "Snapshot" Reports. Easily create reports laid out EXACTLY as your data display! And you can move your fields around! Improved Security. Administrator may set security issues all the way to the "field" level. You may have some users which can access everything, or only certain forms, or only certain fields within the forms. Or only VIEW fields. Larger data handling. Visual LandPro can handle more records than LandPro 6.0 in a more efficient way. Extensive usage of SQL commands combined with FoxPro's Rushmore technology is made in order to improve speed. Unlimited User-Defined Fields for all "property" tables. Unlimited Addresses and Phone Numbers Per Owner - Each name & address record can now have multiple addresses, so that an address may be used for correspondence, while another for payments, and another for other purposes. Same holds true for Phone Numbers! Lots and lots of other features... You HAVE TO check it out for yourself. Order your VLP DEMO CD today! DOI. Division Orders Module. Calculates, prints, and allows you to do maintenance on DOI's. Document Imaging Module. Lets you link unlimited number of Images (numerous types, including TIFF, JPG, GIF, BMP, PCX, etc...) and/or documents (MS-Word, HTML documents) to any record in VLP!. 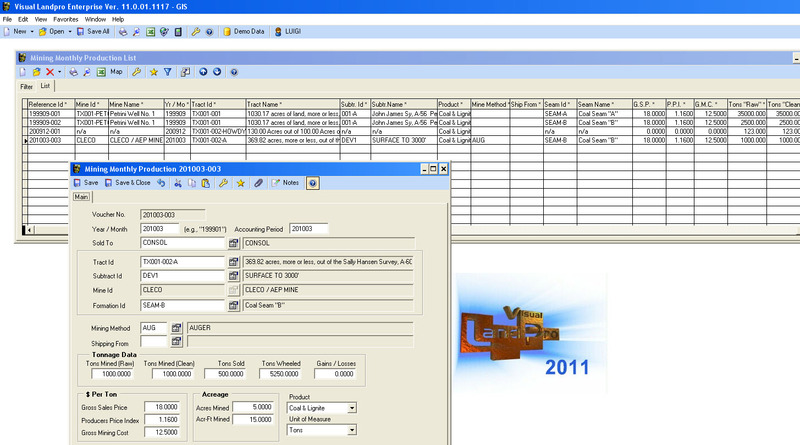 DILMAD Custom Reports Writer for VLP2000. Lets you easily add simple to sophisticated reports to your Visual LandPro system. Thinkgeo MapSuite GIS Editor. GIS Mapping software with Metes and Bounds polygon creation capabilities. 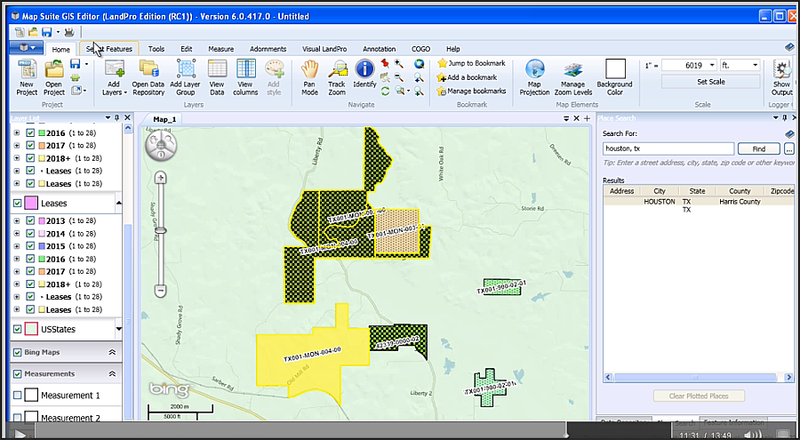 Land Mapping software for land professionals. Use Visual LandPro 2000 with our advanced MapSuite GIS Mapping System, or integrate VLP2000 data into your existing GIS mapping system (such as ArcView) thanks to our LandPro ArcGIS Plugin. You can also connect to our database via ODBC connections, or use Excel files that VLP2000 easily produces to show your land data in your GIS program. 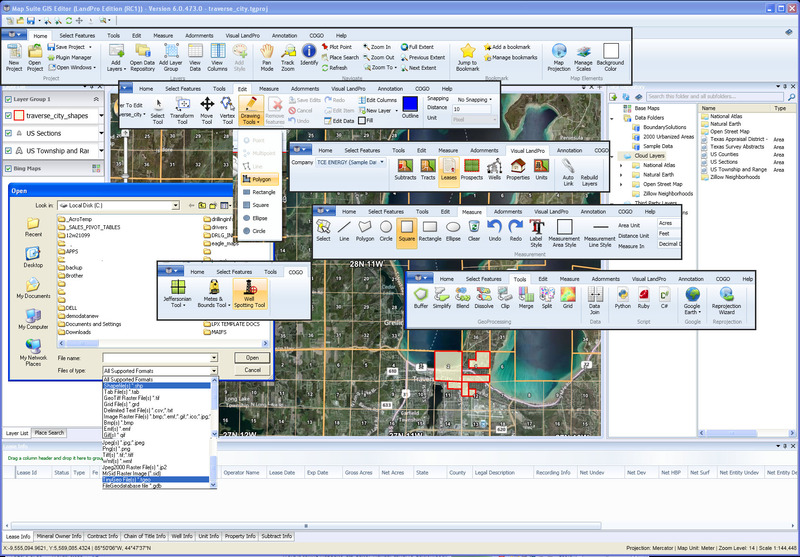 Visual LandPro 2000 is the MOST advanced and comprehensive land system in the market. No need to learn cumbersome 3rd party reports engines... get reports in seconds, not hours. no need to pull your lease files each time you want to review the original lease. Easy linking (via our optional GIS Auto Linker) of SHP files to VLP's Subtracts. 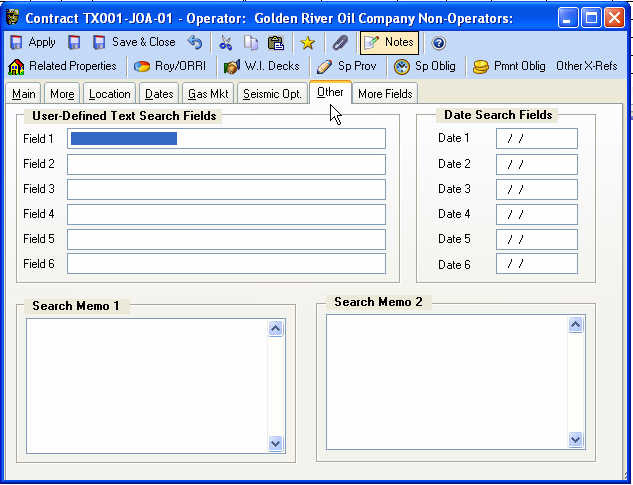 Tract-based Land Management Software for land departments of Oil, Gas and Coal Mininig Companies. Please call us at (281) 363.4213 for more information on how to receive our FREE Visual LandPro Movies Clip CD, along with other documentation. You can also click here to send us a message and request more information. LandPro Express is a secure, online lease records management tool geared for field landmen. It allows the landman to quickly setup leases, tracts, mineral ownership records, and chain of title instruments. Then quickly generates clear, proven-useful reports, including Lease Data Sheets, Lease Purchase Reports, Mineral Ownership Reports, Leasehold Summary Reports, Leases, Memorandum of Leases, Lease Schedules, various types of Exhibit A's, Title Runsheets by tract, Excel reports, and more. The program also allows the field landman (with administrative rights) to "export" the data to Excel, so that it can be used by any land management system for import purposes. 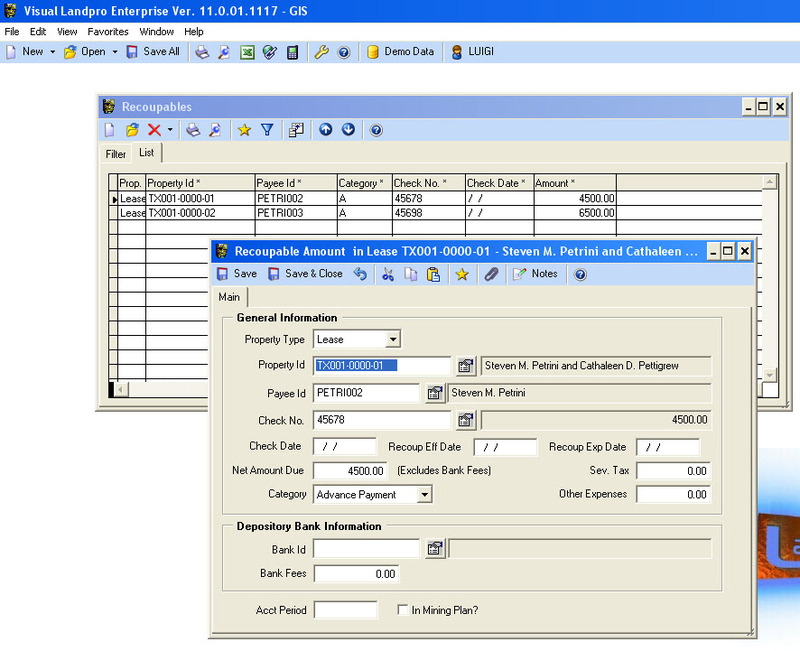 For example, Visual Landpro 2000 (see www.landpro.com) has an optional "Broker Import Module" which allows the LandPro Express data to be imported, thus saving the lease analyst time. LandPro Express allows you to copy and modify existing Lease Templates and Lease Forms, in order to expedite data entry and lease generation. Records can also be saved as "View-Only" thus minimizing the possibility of other brokers in your company making changes to your records. Total "View-Only" login accounts are also available. Review and monitor your brokers' progress and get immediate access to your data. Why pay your Lease Analyst hundreds of dollars to "re-enter" data that your field broker is already familiar with, and has already charged you for? SAVE THOUSANDS of dollars a week by having ALL your field brokers set up their data immediately in LandPro Express. You and they will be able to quickly generate Leases, Memorandum of Leases, LPR's, Mineral Ownership Reports, Exhibit A's, Title History Reports, Acreage Inventory Reports, Special Provision Status Reports, Custom Reports, Custom Lease Templates, and much, much more! If you like what VISUAL LANDPRO 2000 can do... you will LOVE what we've done in LandPro Express! Call us at 281-363-4213. Please call us at (281) 363.4213 for more informationn. Land Mapping software for Mining Companies / Coal Companies. LandPro's new GIS Mapping Stand-Alone Application (replaces our old GIS mapping software) for companies wanting a separate, easy to use, non-ArcGIS based Mapping system. Complete GIS Mapping software with full mapping capabilities, including Metes and Bounds polygon creation capabilities, Metes & Bounds / Jeffersonian creation tools, legal description auto-converter, VLP Auto-Linker, VLP Info Tools, VLP SmartMaps, and much more. Call us for more information or to schedule a free, no-obligation on-line live demonstration of LandPro's Thinkgeo MapSuite GIS Editor program at (281) 363-4213. For Mining Companies / Coal Companies. Automate your monthly production royalty distribution process. Calculates and prints royalty checks, plus it easily exports your royalty data to Microsoft Excel. This program keeps track of Tons Produced ("Raw" and "Clean"), Tons Sold, Tons Wheeled, Misc. Gains / Losses, unlimited number of royalty payment obligation types, no-pays, Federal Tax Withholds, Recoup Amounts, Check Returns, and much more. Specify multiple royalty formulas for each lease, enter your monthly production data, then watch VLP2000 calculate your royalty payments, taking your recoups under consideration. This add-on module is ideal for COAL COMPANIES needing a flexible royalty distribution software system. Call us for more information or to schedule a free, no-obligation on-line live demonstration of LandPro's Coal Mining Royalty Distribution Module at (281) 363-4213. Mining Companies (coal mining and other hard-minerals) can quickly setup Monthly Production worksheets thanks to our Mining Revenue Distribution Module. 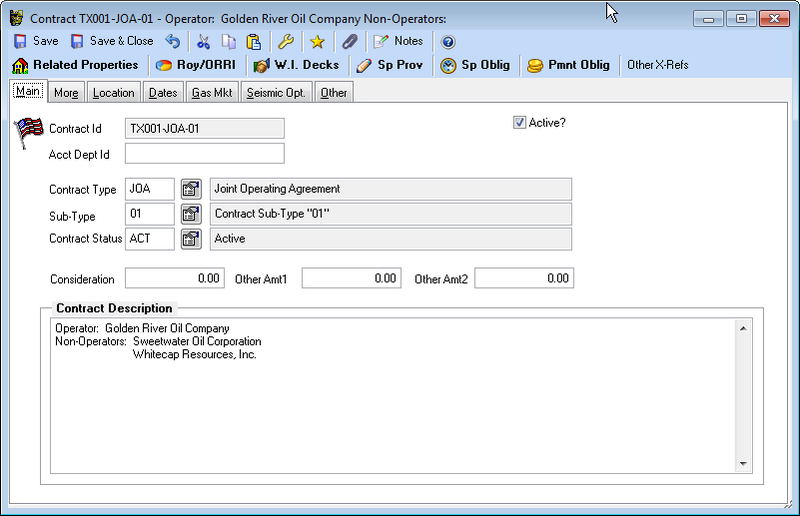 LandPro will then automatically "split" your production to the various royalty owners, and calculate what payments should be done. This is an example of what your Coal Mining Royalty Checks will look like. Checks can be easily modified to fit practically any 8.5 x 11 sheet. See other images regarding our Coal Mining Software module for Visual Landpro 2000! Automatically calculates revenue and expense Division Orders using existing data. Unlimited number of deck calculations, substance, and payout situations can be accomplished by using this module. Simply specify the well or unit that you wish to generate a DOI on, and VLP will automatically find all tracts related to your well/unit, then all mineral ownership interests, all leases, and all lease burdens and Working Interest decks. You even have the option of changing each tract’s Participation Factor. 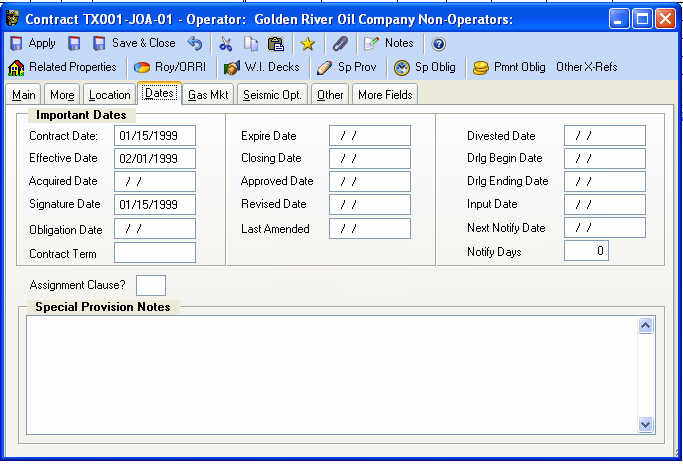 Division Orders Module calculates, prints, and allows you to do maintenance on DOI's. Call us for more information or to schedule a free, no-obligation on-line live demonstration of LandPro's Division Orders Calculation program at (281) 363-4213. Dilmad Report Writer "Add On"
Stand-alone Custom Report Writer for Visual LandPro 2000 - allows you to create NEW reports & Custom Excel Exports in VLP2000. Easily create and add to Visual LandPro custom reports (worksheet & form-style) using DILMAD's fancy Report Add Wizard. We highly recommend this powerful ADD-ON to anyone using Visual LandPro 2000! Once you've created your new reports, anyone accessing VLP2000 on your server will automatically have access to them. Dilmad Report Writer is specific to VLP2000 and not for VLPSQL. Call us for more information or to schedule a free, no-obligation on-line live demonstration of LandPro's Dilmad Report Writer program at (281) 363-4213.